Home Tags Posts tagged with "zsa zsa gabor’s latest photos"
Zsa Zsa Gabor was rushed to the hospital late Saturday, according to her family. 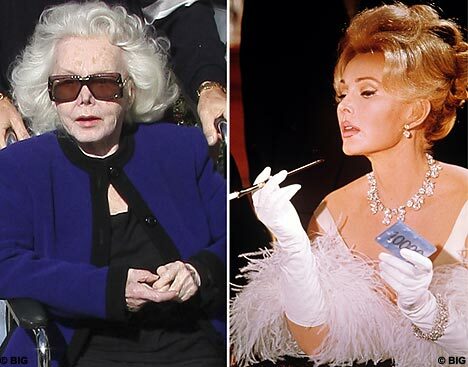 Zsa Zsa Gabor, 94, was taken from her home to UCLA Ronald Reagan Medical Center, her daughter Francesca Hilton said. She did not provide details. Her husband, Frederic Prinz von Anhalt says she is doing better hours after she lost consciousness at her Los Angeles-area mansion. Frederic Prinz von Anhalt said late Saturday that Zsa Zsa Gabor’s fever is down, she’s responding to antibiotics, and she has opened her eyes, though she hasn’t spoken. Doctors at UCLA Ronald Reagan Medical Center are planning to replace a tube that was bleeding in Zsa Zsa Gabor‘s stomach on Sunday. Frederic Prinz Von Anhalt says Zsa Zsa Gabor is a “fighter” and he’s confident she’ll make it. Zsa Zsa Gabor has suffered major health problems in the last year, including hip replacement surgery and a leg amputation. She has been unable to walk since a 2002 car accident. The Hungarian-born actress has been hospitalized repeatedly since breaking her hip in July 2010. Zsa Zsa Gabor, the second of the three celebrated Gabor sisters, is famous for her many marriages and strong personality as well as her acting prowess. The 94-year-old actress appeared in a handful of films, but has been most famous for playing the role of herself on talk shows, game shows and at times the news.